A simple, more cost effect alternative is to use a type of elastomer (rubber) bearing. An elastomer bearing typically consists of two metal plates which are held together by layer of vulcanised neoprene rubber. The SF-3510T is a type of elastomer bearing. 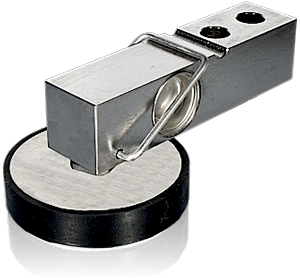 For platform applications, the rubber/metal foot SF-3510T can be used in conjunction with the T end version of the Load Cell 3410 an the Load Cell 3510. The load cell is mounted on the underside of the platform with the loading end (Live end) facing down. The foot is then held in place by a M3 bolt and lock nut. When the platform sits on the floor the load is transferred though the domed hardened load adaptor into the load cell. The SF-3510T-HA has the additional feature of height adjustment to take care of uneven floors etc. The flanged version of the foot (SFM-3510) is used in the same way but it has a plate with four holes to secure the foot to the floor or a supporting structure.